With classic simplicity and a painter's feeling for atmosphere and detail, Isak Dinesen tells of the years she spent from 1914 to 1931 managing a coffee plantation in Kenya. Isak Dinesen is the pseudonym of Karen Blixen, born in Denmark in 1885. After her marriage in 1914 to Baren Bror Blixen, she and her husband lived in British East Africa, where they owned a coffee plantation. She divorced from her husband in 1921 but continued to manage the plantation for another ten years, until the collapse of the coffee market forced her to sell the property and return to Denmark in 1931. There she began to write in English under the nom de plume Isak Dinesen. Her first book, and literary success, was Seven Gothic Tales. 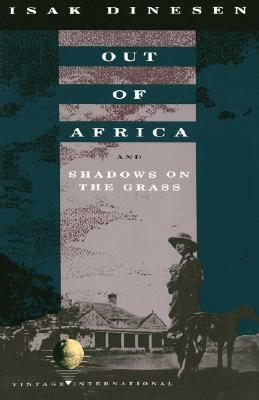 It was followed by Out of Africa, The Angelic Avengers (written under the pseudonym Pierre Andrézel), Winter's Tales, Last Tales, Anecdotes of Destiny, Shadows on the Grass, and Ehrengard. She died in 1962.